Deep Silver's zombie sequel will let you throw haymakers to your heart's content. Dead Island was a fairly unique take on co-op zombie games in that you couldn't just mow down your opponents with automatic rifles. Powerful guns were readily available, but bullets were hard to come by, which usually left careless players fleeing backwards from the zombie hordes while madly swinging a boat paddle. It created an interesting dynamic, one that Deep Silver will likely recreate for Dead Island: Riptide. But is there another option? What if you want to throw aside your weapons and punch the zombie apocalypse square in the face? 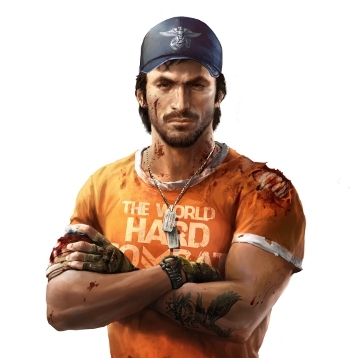 Dead Island: Riptide has you covered with new character John Morgan. Unlike the original characters, each specializing in a particular weapon style, Morgan is a straight-up, hand-to-hand combat expert who can pound the snot out of the undead with his bare fists. "So one thing we really like about our community is that they did so many crazy mods for Dead Island on PC," a Deep Silver representative explained. "One of the mods was an awesome Fist of the North Star thing and a dude made a hilarious video out of it... Obviously, our character is not exactly like this, but since people liked this mod so much, it made us think about doing a hand-to-hand combat character." While Morgan's fisticuffs aren't likely to be as powerful as those from the North Star mod, the decision is a surprisingly natural one. Dead Island's physics engine and melee-focused gameplay made physical engagements with zombies incredibly visceral and satisfying. When it came to fistfights however, punching was usually a fallback option reserved for when other weapons weren't available. Now with Morgan's fighting style, hopefully complete with a zombie-punching skill tree, an entirely new playstyle can be integrated with the core game. Deep Silver confirmed that despite Morgan's addition to the game as its fifth character, Dead Island: Riptide is still a four-player co-op affair. Zombie and fist-fighting aficionados alike have until April 23rd to settle on the fighting style of their choice when the game launches for PC, PS3, and Xbox 360.